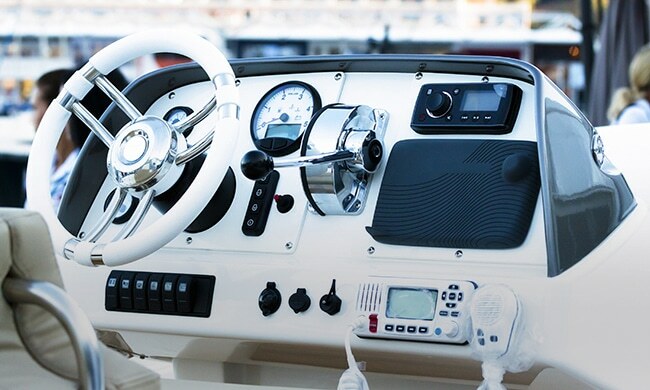 Whether you need basic marine radio installation or would like to outfit your boat with the latest technology, you can rely on Precision Installations to get the job done quickly and efficiently. Our highly trained technicians have years of experience outfitting boats with all types of marine communication system components. No matter if you fish, water ski or just enjoy exploring local waterways, we know the time spent on your boat is important to you. You can be assured that no matter how you plan to outfit your boat—with audio, visual or lighting—we’ll get it done right and in time to get you back out on the water. We specialize in any components that run off a 12-volt battery and have the capability to troubleshoot and fix any electronics problem, whether it involves your audio system or marine lighting. All of our marine communication system installations and repairs are done in-house at our Precision Installations location in Appleton. Stay safe on the water with marine radio installation or installation of cameras, mirrors, lighting and more. Call us at 920.380.1360 or contact us to get your boat ready for a fun season on the water. "I am so happy with the new marine radio in my boat. I'm confident I can go almost anywhere, knowing I can contact someone in an emergency. "